Marriage Isn't For Everyone...Or is it? It’s release month for A LOVE TO REMEMBER, book #7 in my Disgraced Lords series. I had the most fun writing this book, because both the hero and heroine had an aversion to marriage—each for good reason. But as in any good romance something had to change, and as usual it took my heroine, Rose Deverill, the Duchess of Roxborough to shake things up. Philip Flagstaff, Earl of Cumberland and Rose have been lovers for two years but neither one is willing to be brave and have faith in their love. How was I going to make these two face their fears and reach their happy ever after? I’d already got her best friends, Marisa (A Whisper of Desire book #4) and Portia (A Touch of Passion book #3) to review the questions and they both said they were perfect. They would make Rose take stock of her life and situation. Have you resolved your major relationship dilemmas from the past? Rose: “I think so. I mean, I was married off by my father to a much older man and I found nothing I wanted in a marriage—certainly not love. However, I was gifted with a son, Drake, whom I love dearly. Being Philip’s lover for past two years I now understand that when love is involved marriage might not be as hard and unyielding as I once thought, and it might even be wonderful, plus I want more children. Are you ready to give up the freedom of continuing to experience other relationships? Rose: I became a widow five years ago at one and twenty, and I decided to ensure no man ever wanted to marry me again. I wanted freedom, my freedom. So I took lovers, and was not very discrete about it in order to build a terrible reputation. However, as soon as I started my affair with Philip I was ready to give up my wicked ways. I’ve been, if not in love, at least infatuated with Philip since I was a young girl of sixteen but he’d never noticed me before. I’m worried that my reputation is what drew him to me and he does not see me as a viable marriage option. Are you able to accept your own limitations and share them openly? Rose: I believe so. I realise that having had a taste of freedom I can be a bit outspoken and independent, but Philip and I think alike and I don’t think he is wary of my opinions. Do you think you can stay the course even if there are unexpected challenges? Rose: Oh, I’m sure there will be challenges, I have a six-year-old son! Luckily Drake loves Philip and I’m sure Philip feels the same way. He spoils Drake, taking him to the museum and to the park etc. The challenge for me is to ensure Philip loves me, really loves me. Our families are friends. Portia, Philip’s sister is my best friend. I don’t want him to marry me put of a sense of duty or because he loves Drake. One loveless marriage was enough. No. I want all or nothing…what frightens me is that Philip may say no, and I’ll have nothing. Do you understand that love and commitment need constant reinvestment of time, energy, and love? Rose: Of course. That’s why I’m willing to fight for what I want, for what I deserve. Love is a prize to cherish and nothing so perfect comes without work. I just hope Philip understands how I feel. I hope you’ll read A Love To Remember and cheer for a happy ending to Rose and Philip’s journey. 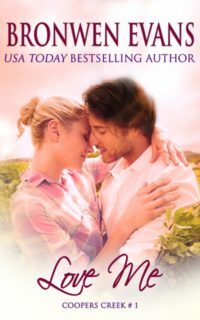 QUESTION: Leave a comment and you could win an eBook copy of LOVE ME, book #1 in the Coopers Creek series – What is the name of Rose’s son? Open internationally. Closes 16th September 2017. Rose’s son is Drake Deverill, The Duke of Roxborough. Thanks for the chance to win. Drake is her son, the Duke of Roxborough.